Complete bath line, Geneva includes faucets, shower valves, shower arm, and diverter tub spout, as well as shower trim for use with either Grohtherm© thermostatic temperature control valves or Grohsafe© pressure balance valves. All components can be coordinated to feature Geneva lever or cross handles. 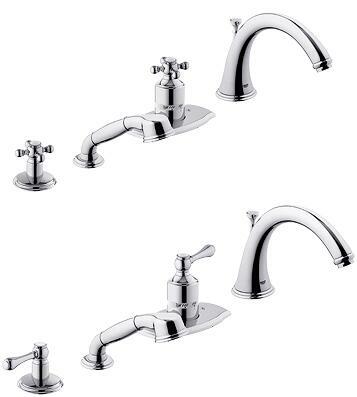 The GROHE Geneva line is available in chrome; chrome with polished brass accents; and in InfinityFinish, polished brass, satin nickel, and satin nickel with polished brass accents. are exclusive to the thermostatic tub filler.